So to address that frustration, today I want to talk about: 3 Creative ways to find topics to fill your social media posting queue every day. 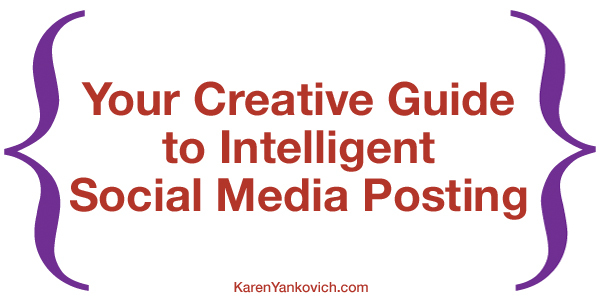 3 Creative ways to find topics to fill your social media posting queue every day. One of my favorites is Quora. It is actually filled with good questions and thoughtful answers that make you think. You can adjust your settings to pick what topic areas you would like to receive their feeds. Make it niche specific if you can and you are ready to rock and roll when an engaging question comes up! Another option is Reddit where everything (and I do mean everything) is discussed. To capture and organize important blogs that a) you like to read and b) carry important information for your business niche. Share valuable information by repurposing others’. You don’t need to know everything nor do you need to post something every day that is unique. Sharing other’s stuff is a great way to get the job done. Feedly has a great feature that allows you to organize all of your important blogs by topic so you know exactly where you need to go AND allows you to post directly to all of your social media platforms that you link. One stop shop bing bang boom – you’re done! 3. 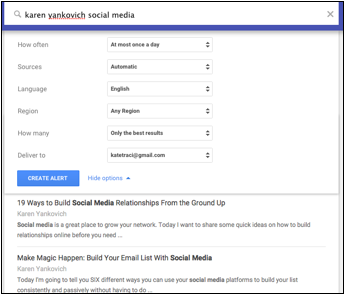 Set Google Alerts to put Google to work for you! With Google Alerts you can monitor the web for interesting content, but it doesn’t stop there. When you set an alert you will be notified of trending topical articles based on your alert subject and headline, as well as questions posted on the web that are niche specific to you. One of the best and quickest ways to be branded an expert is to find these questions and post your expert answers linking to your website driving traffic back to you. Also use this tip to discover new markets, new trends, new emerging niches related to your business that you could jump on, get ahead of, and start expanding your expertise. Try to be as precise as possible. The more precise your search terms are, the more relevant your alerts will be. Use quotes around a group of words if you are looking for them together. For example, [“White house”]. Use a minus sign (–) in front of words that you want to exclude. For example, [paris -texas]. Use the site: operator to limit your search to specific sites. For example, [congress site:nytimes.com]. Set and create as many alerts as you like. Delete or refine them as you go and as you start to learn what search terms bring you the best results online. If you use these three ideas in conjunction with your regular posting (linking to your blogs, promotional posts, and foundational content) you can truly create a consistent presence with minimal effort. We all need to be on social media, we all need to be visible, and we all need to take time to actually run our business. I recognize that because I too am trying to “do-it-all” just like you. I challenge you to pick one of these ideas to implement today. Don’t wait, don’t add it to your to-do list, just do it. You will be glad you took a little time out from your business to streamline your marketing plan and reduce social media headaches today. And in the end that is my eternal hope for you: may social media be headache free and profitable! Need some help with how to set up Google Alerts? Trying to pick what topics to organize in Feedly? Still not sure how to use Quora or why? Join me in my LinkedIn group! I’m available to answer these questions and any more you have. Thanks for these sites to gather more information and post to. My pleasure Virginia! Hope they’re helpful.